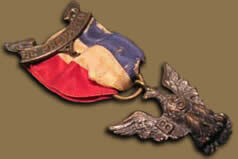 The T. H. Foley Eagle is the first type of the award given with probably less than 350 awarded. It is the most desired of all issued Eagle types. Most Foley Eagles will have a hallmark on the back of the scroll: "B.S. of A. Pat. 1911 T.H. Foley, N.Y." or the example shown below says, "B.S.A., T.H. Foley, 1 Madison Ave, NY". Foley’s have a simple or crude clasp for the pin. 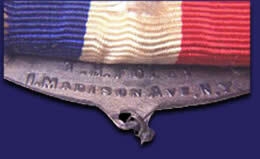 Later medals by different manufacturers use spinlock clasps. If the pendant ring is perpendicular to the eagles head you have a Foley Eagle. Most Foley Eagles have this feature but a rare few have the ring in the same horizontal plane as the eagle. Another unique feature is a characteristic long wire with a double knot hanging below the scroll. 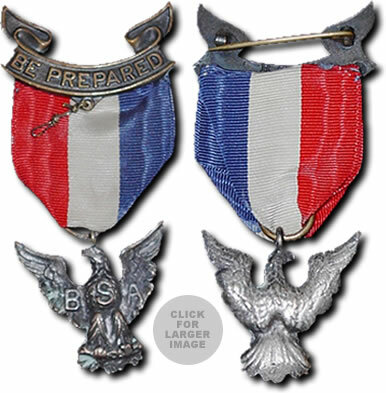 Special thanks to the family of fourth generation Eagle Scouts for providing this image. The hallmark may be found on the back of the scroll. Note the pendant ring attachment to the eagles head in this photo. It is an exclusive characteristic of the Foley Eagle, but in a few rare instances the ring is parallel with the Eagle. Copyright ® 2010 EagleScoutBadge.com. All rights reserved.